Abstract: Going back to the days of the dot matrix printer the entrance of the ink-jets on to the market heralded a victory for those fed up with the noise of their machine-gun like ribbon printers. Going back to the days of the dot matrix printer (for those of you who remember what those are) the entrance of the ink-jets on to the market heralded a victory for those fed up with the noise of their machine-gun like ribbon printers. Ink-jets were quiet, fast, and produced near Laser printer quality pages. The only problem was that the ink cartridges either dried up, or ran out of ink rather quickly. For the most part Laser printers have remained out of the reach of the SOHO office crowd and home user because of their price, and size. Of all the computer peripherals you can get, Laser printers tend to be the biggest and boxiest of the bunch. However, the move from very popular and inexpensive ink jet printer is starting to happen as a new class of SOHO laser printers enter the market. The Samsung ML-4600 is one such offering, and the subject of this review. 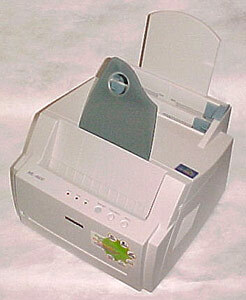 The ML-4600 is a 1200dpi resolution laser printer capable of 8 ppm in black and white. Based on a 66Mhz RISC chip, it comes with an integrated 4MB of memory and a 72pin SIMM expansion slot. The memory can be upgraded to a maximum of 68Mb. The printer connects to the computer via USB or parallel cable and has a foot print of about the size of a fax machine. The ML-4600 comes with CDROM of manual and drivers, parallel printer cable, power cord, quick start guide and start up toner cartridge. USB cable is not included. Setting up the printer is standard as printers go. Once the toner cartridge has been installed (it comes with one that lasts about 1000 pages) in the bay, the printer is connected to the computer via the USB or parallel cable and the drivers are installed. The printer has all of its manual on the driver CD in PDF format, and only a quick start poster is included. Once the drivers have been installed its time for a test print to see if every thing is well, which it should be of course.